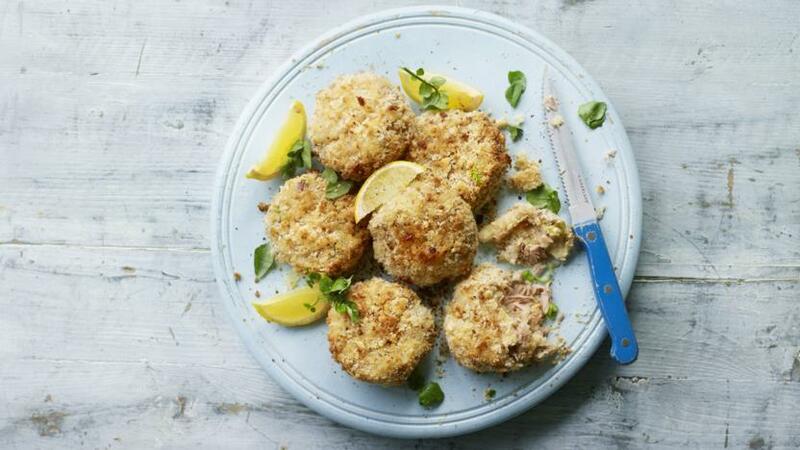 Tuna fishcakes are super-easy, quick and cheap. You can also make and freeze them. Serve with a crispy salad, rice or vegetables for a tasty and filling dinner. Each fishcake provides 170kcal, 10g protein, 19g carbohydrate (of which 1.5g sugars), 5.5g fat (of which 1.5g saturates), 2g fibre and 0.6g salt. Put the potatoes in a saucepan, cover with cold water and bring to the boil. Reduce the heat to a simmer and cook for 15–20 minutes, or until tender. Drain the potatoes and return them to the pan with the butter, mayonnaise, lemon zest, spring onions, salt and a generous amount of black pepper. Mash together until smooth. Stir in the tuna and set aside. Put the bread in a food processor and pulse until it crumbs. Put the egg, flour and breadcrumbs into three separate shallow bowls. Place on a baking tray and bake for 15 minutes, or until the breadcrumbs are just golden. Serve. To freeze the fishcakes, once shaped, wrap them individually in cling film and freeze for up to 3 months. Defrost in the fridge, then cook for an extra 5 minutes to make sure the breadcrumb coating gets crispy in the oven.